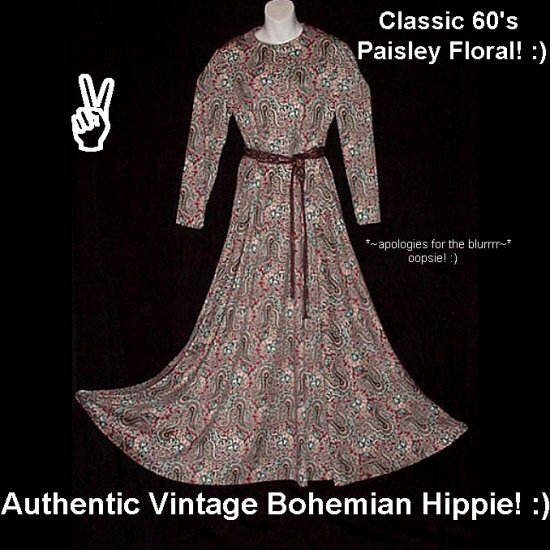 An absolutely SUPERB Example of the FLOWER POWER, Summer of Love Era Clothing, this AUTHENTIC Vintage 1960's to very early 1970's Maxi Dress is Created in a PAISLEY FLORAL, Wearable Work of Art! Be sure to click on the scroll arrows above to see each picture, click directly on each thumbnail picture, then directly on the main picture for a larger pop~up view of each! She is 40+ inches around at the Underarms with Lots of available stretch for comfort, Working Beautifully on Busts between 36 and 40 inches around, Waist **UN-stretched** is 34 inches around with plenty of stretch available for comfort and movement, Hips Flare Way Out and are 60 inches around, Arm Openings 20 inches around, Length from the top of her shoulder to hemline is a Tall 57 inches! Inside Tags are Crisp and Pristine! Superb Vintage! Rarely if ever worn! Zero Visible Flaws! Another Super FUN and Romantic Authentic Hippie Boho Gown for Your Vintage Collection! Please be sure to check my 15 year online reputation of 100% feedback in honesty and customer satisfaction! All sales are final with no returns, so be sure to contact me prior to your purchase and I'm happy to help you in any way that I can! Here at Threads, your Credit Card payment is welcome using our Direct Checkout, Cashier's Checks, Money Orders and Cash are all welcome as well for your convenience and privacy! I ship Monday through Friday within 48 hours of receiving payment (usually 24 or less)... it's so much fun receiving a package, that I devote extra effort in getting your goodies wrapped, packed and in the mail to you as quickly as possible! It has become legend, a historic symbol... the love generation. People from all walks of life, young and old alike, try to recapture the "Woodstock Spirit"
All of this started a huge Bohemian lifestyle and clothing movement, especially in San Francisco and other select California cities, thus designer names like Gunne Sax, Lorrie Deb, Candi Jones, Rag Dolls and a few other gorgeous lines were born! These vintage dresses and gowns are just as popular, sought after and highly collectible today as they were in the 60s and 70s! Perhaps even more so, as "Rainbow Gatherings" are still put on all around the world today! 2009 celebrated the 40th anniversary of The Woodstock Music and Art Fair, more commonly known as "Woodstock" or "The Woodstock Festival" and in this spirit we are offering all of our finest Authentic Vintage Romantic Bohemian, Hippie Chic and Renaissance Fairy Dresses and Gowns! *********Be sure to take a peek in the rest of the shop******** for more vintage Hawaiian Dresses, Hippie Woodstock Wear, Hawaiian Shirts, Gunne Sax Gowns, Lace Nostalgia Dresses, Angora, Mohair, Leather and Fur Boots, Designer Leather, Leopard and Lace! eCrater is the friendliest place to shop for both buyers and sellers, where we can offer special savings to you! HAWAIIAN SHIRT Black & Tan TORI RICHARDS of HAWAII Floral ALOHA Print VISCOSE Men's Size XL! HAWAIIAN SHIRT Classic Green TROPICAL BLOSSOMS Floral Print ALOHA Men's Size S! HAWAIIAN SHIRT Vintage ALOHA Floral HORIZONTAL BUTTONHOLES Awesome ATOMIC HAWAII Print Men's M! HAWAIIAN SHIRT Classic VINTAGE LONGBOARD 1939 PACKARD & FORD Aloha BEACH Print Size XL NEW! HAWAIIAN SHIRT Vintage 60's ALOHA Tiki HORIZONTAL BUTTONHOLES Tribal HAWAII Print Men's S~M!